When too many is not enough . . . G.E.V., and later Shockwave, provided us with different maps upon which to wage our battles. This was a good thing. GEVs screamed up the waterways while Heavy Tanks crashed through the woods, with those pesky Infantry running here, there, and everywhere, being so difficult to root out. Scores of futuristic battles played out on our floors, beds, and tables, with hundreds more envisioned in our heads. What we didn't have were the means to create those massive battles, stretching across fields of fire, with entire companies being thrown into the fray. Unless we were willing to purchase extra copies of G.E.V. and/or Shockwave (or had a friend with a copy! ), we had to accept the limitations of the maps and the quantity of units in the base sets. Ogre Reinforcement Pack changed that dynamic overnight. First released in 1987 and later reprinted in 2000, Ogre Reinforcement Pack was a collection of both the maps and counters from G.E.V. and Shockwave. This is what Ogre fans had been waiting for! We had the rulebooks - we just needed more: more maps and more counters. That alone was worth the price. 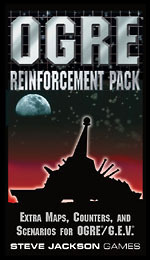 But Ogre Reinforcement Pack had more for us. It had rules for the "other" Ogres: Mark I, II, and VI, plus the Fencer. There were towing rules (the grand-pappy of the new Vulcan towing rules). Ogre equivalents, first published in The Ogre Book, were republished here. And a table for generating random damage to immobile Ogres was introduced. What a wonderful game aid - so simple, and yet offering such potential for future games. But there was still more! We didn't have to dream up the multi-map battles; three were provided for us. "The Day After" was a three-map scenario making use of the new towing rules. "Fake Out" also used three maps, and introduced a bit of a 'fog of war' concept, in that the defenders did not know the attackers' starting objective. Finally, there was "Body Blow," a huge, four-map scenario with scores of units. You knew it was going to be good when the second sentence of the scenario description instructed you to "allow at least an hour to set this scenario up, and four or more hours to play it . . ."
Unfortunately, Ogre Reinforcement Pack has been a very difficult expansion to find, commanding unreal prices in online auctions. Although some of the rules have been superseded by the Ogre Designer's Edition rules, there is still a lot to love. None of these scenarios has been easily acquired . . . until now. So please enjoy the second installment of our 40th Anniversary of Ogre retrospective, Ogre Reinforcement Pack!